The first dedicated field guide to Honduras, featuring 1,000 illustrations on 73 color plates. Guide to the Birds of Honduras also illustrates the majority of the migratory species. Along with the standard species accounts Guide to the Birds of Honduras has a lengthy chapter on 'Where to Find Birds in Honduras'. There are numerous tables toward the end of the book, one of which has an extensive list of botanical names for nectar sources that hummingbirds utilize and each species of hummingbird observed for each flower. A unique feature is a large pull-out map, approx. 16 × 25 inches, fitted in a pocket in the backcover. One side illustrates a basic layout of ecosystems, while other side is labeled 'Important Bird Sites in Honduras' and features over 200 points of interest throughout the country. These GPS-coded marker numbers are embedded in the text throughout most of the book and are all laid out in a separate table. This layout means that all the numbers can be easily cross-referenced. 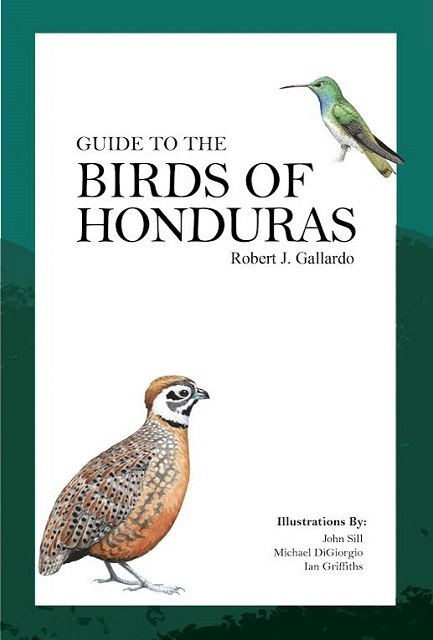 Guide to the Birds of Honduras covers over 98% of the birds of the surrounding countries of Guatemala, El Salvador, Belize and Nicaragua. 554 pages, 11 plates with 33 colour photos, 73 plates with 1000 colour illustrations, black & white distribution maps and 1 fold-out colour map.